Mindfulness private tuition means that you can choose a course or a bespoke programme to suit your schedule and personal needs. Drop in and attend our mindfulness toe-dippers on the first Friday of every month. This is a great way to start your weekend or event your month to refresh and deepen your practice. All levels are welcome. The mindfulness-based stress reduction course (MBSR) follows the recognised well-researched curriculum. MBSR is regarded as the gold standard in mindfulness training as it is the most widely taught and validated programme available. There is a body growing of research evidence on the physical and psychological health benefits of mindfulness. Our next brief Mindfulness-Based Cognitive Therapy (MBCT) course is on Tuesdays at 7:15pm starting from February 2018. MBCT was developed at Oxford University and has National Institute for Clinical Excellence (NICE) recommendation. The BeingWell prides itself on running quality courses with a maximum of 10 participants and led by highly-qualified chartered psychologists. Let us know your availability to attend a class, whether you would prefer a shorter or longer course and you can also choose to have shorter or longer meditation audio recordings to practice during the week. It is the same fee whether it’s just yourself or whether up to two friends join you. Private mindfulness tuition may be for you if you have a schedule that doesn’t suit a regular same-day / same-time class arrangement. You may also live remotely and would like to have mindfulness by Skype or Facetime. Some people prefer much smaller groups and would like to practice with one or two others whom they know well. This is a regular mindfulness drop-in session for newcomers as well as for those who have been meditating for some time. Regardless of what your knowledge or experience is of mindfulness, you can drop in to meet others who practice mindfulness and meditation. These Friday evening meetings are a great way to reset your mind from working-week mode to a slower weekend gear. These sessions are held (mostly) the first Friday of every month from 6:15pm until 8pm. There are a maximum of 12 places so early booking is advised. From one-day tasters, modules on existing training courses to bespoke longer-term mindfulness courses to meet a business need. Mindfulness has drawn attention at the White House and 10 Downing Street, turned heads at the World Economic Forum and worked its way into the curricula of the world-famous business schools. 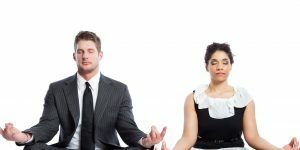 A growing number of businesses are recognising what mindfulness has to offer and have been early adopters of mindfulness in the workplace.